My parents had very inexpensive art reproductions on the walls when I was a kid. 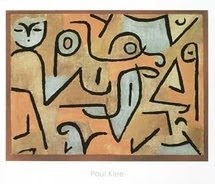 I honestly believed the Paul Klee picture in their bedroom depicted the day my dad ran over our water sprinkler with the lawn mower. I felt guilty about the thrill of witnessing the sprinkler's destruction before my very eyes. Seeing my dad make a mistake and swear about it made a big impression, too. I'd been fond of that lawn sprinkler with its two bent arms doing an angled dance. Years later when we got our grocery store encyclopedia set, I saw images of many-armed Hindu gods. I hoped Dad wouldn't mow into the sensuous, revolving sprinkler dance. Buying their first and only house in 1958, my parents also bought out the previous homeowner's share in a co-op lawn mower. Our next door neighbors each owned the other thirds of the mower. Owning part of a mower should have warned me about condominium ownership! I loved lounging on my parents' bedspread staring at the Klee print and making up stories. There's a child watching a dog, a duck, and a fish...a sprinkler...a mower. After the calamity we had a rainbow arc water sprinkler, but it never had a pot of gold or the fascination of the dancer sprinkler. Instead I coveted my neighbor's sprinkler. What did Moses' tablets say about those sprinklers that traveled along the hoseline looking like mechanical tractor ants from "The Twilight Zone"? Our yardkeeper hit a brick with his mower, not a sprinkler. Good nightie night.